Synopsis: The Amazing Adventures of Kavalier and Clay is a work of historical fiction and is set in New York, Prague and Antarctica during WWII and the Golden Age of Comic Books (the late 1930s to the mid 1950s). Samuel ("Sammy") Klayman is a 17 year old American Jew and lives in a cramped apartment in Brooklyn, New York with his single mother and grandmother. Sammy is an avid comic book fan and an aspiring writer whose head is buzzing with ideas for adventure stories. At the beginning of the novel Sammy is then forced to share a bed with his 19 year old cousin Josef ("Joe") Kavalier. A trained escape artist, Joe was able to smuggle himself out of Nazi-occupied Czechoslovakia (with help from his Harold Houdini-esque mentor) and has come to his relatives to seek refuge. When Sammy then discovers that Joe is also a gifted artist he immediately suggests that the two of them work on a comic book series and is then able to persuade his boss into giving them an investment. Sammy and Joe then quickly become best friends and, between the two of them, create a Nazi-fighting superhero character called The Escapist. Their comic book series then becomes a tremendous best-seller and goes on to sell millions. However, as Joe's efforts to get his family out of Europe are continually thwarted by anti-semitism and bureaucratic red tape he becomes increasingly frustrated and angry. When he then falls in love with a beautiful, bohemian woman called Rosa Saks his guilt at his own happiness and success only grows. Meanwhile Sammy, who is secretly gay but firmly in denial about it, struggles with his feelings until he meets a handsome radio actor called Tracy Bacon who forces him to acknowledge this part of himself. I can't remember exactly when or where I first found out about this novel but it was on my TBR list for years and I only managed to get round to it during this year's Jewish Book Week. Although I will say that this book didn't fully live up to my very high expectations I still found it to be an extremely meaningful and rewarding read. The prose in this book is so eloquent, haunting and beautifully-written and the story has such a big scope: touching on anti-semitism, Jewish folklore, LGBT rights and family relationships. It's the theme of escapism which is the major theme of this novel though and that deeply resonated with me - because I happen to be a big reader and watcher of genre fiction which is commonly referred to as "escapist" and the term "escapist" carries such negative connotations usually. Nine times out of ten if a critic refers to a story as "escapist" they'll usually mean it in a disparaging sense which is completely ridiculous when by their very nature that's what stories are supposed to be! In this book Chabon makes the argument that escapism through literature and stories is essential to our humanity because life can be so harsh and cruel (there have been many writers who have made similar arguments including J.R.R. Tolkien, C.S. Lewis, G.K. Chesterton and Neil Gaiman). In this book Joe's art and magic acts keep him sane by giving him some solace in not being able to help his family, and Sammy's reading of comic books helps him to cope with his father abandoning him and with his insecurities about being a polio cripple. 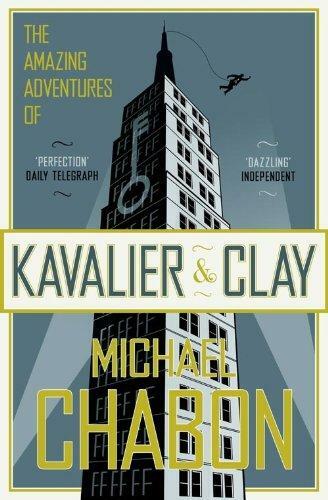 And although there are still people today who dismiss superhero stories as silly, childish wish-fulfilment fantasy Chabon effectively shows that the rise of the superhero genre was in fact very much linked to contemporary life and with everyday reality.